The Writers Alley: Get in Late, Leave Early! Get in Late, Leave Early! So much subtext in that one little phrase that I immediately stopped and wrote it down. What GOLD was in that phrase and it has changed forevermore how I write. When you are told to get in LATE and leave EARLY you suddenly realize how much isn’t needed in your fiction. Why have your hero standing at the door of his home thinking if he should propose to the heroine—have the scene start at her door. Benefits of getting in late? If you start the scene, it’s like coming into the middle of a conversation and if intriguing enough, your reader is going to want to find out what is happening. There is DRAMA in arriving late to the party. Think of it this way: you are running late and burst into the plaza just as the bride and groom are pronounced man and wife. You are the maid of honor. That scene would not have had the power or the potential for a great deal more conflict if we had started back with the maid of honor in her car, buried in traffic five miles long. We don’t need the backstory to APPRECIATE the tension. Again, there would be tension, but ALSO there would a hook. We all want to keep our readers reading. Whether at the end of paragraph break or at the end of a chapter, we want to keep the readers flipping pages. It is so important to keep them going through the story as Sherrinda pointed out earlier this week. When you leave the moment early, you are giving your reader an incentive to keep going to find out when that thread is going to be picked up again. Another place where get in late, leave early has benefited me is tightness and word count. When your story is viewed through the blinders of this one little phrase you will start to realize that much of your beginning scenes are merely SETUP. Driving, primping, internal exposition, rehashing past scenes, all the little “filler” scenes we put in because we think are needed are not necessary. So the next time you pull up your document and look at each of your scenes, think of this: can I get in later? Can I move the entrance of my character farther into the moment so it is more dramatic, grabs more attention, adds deeper tension? 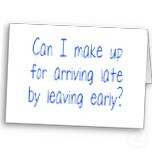 And can you leave early? End an argument by walking out, end a scene, chapter, whatever at the moment least expected. Have your character say a zinger of a line and then CUT. Stop. Leave the scene and you’ve got a hooked reader. Keys to performing these methods would include: cut a lot of the internal exposition that rehashes what happened before, include more action, more dialogue, let your character speak through their actions—and save those moments of introspection for a later, more appropriate time. Just thinking in “getting in late, leaving early” will completely change how you write and how you edit. You can always go tighter. I could see how memorizing that one phrase could really ramp up tension in a work. Great post! Great thought on keeping conflicts tight and keying them up. What a great post! I have heard the saying, but for some reason, I've never clued into the "leave early" part. Thanks for giving practical suggestions on how to make this handy dandy phrase effective in my wip. This is excellent advice! I plan on implementing today! What a FABULOUS sentence. And yes, THANK YOU, Rachel Hauck (and CASEY!). "We don’t need the backstory to APPRECIATE the tension." Love this point. Very helpful. Thanks Casey! I never looked at it that way before, but it makes so much sense! Thank you for this great tip! I love this, Casey! Great reminder! Another thing I heard from author Donita K. Paul--never end your chapter with your character falling asleep. Your reader has no reason to turn the page. Your reader may just decide to go to sleep too. Thanks for another great post. This is why The Writers Alley is a not-to-be-missed blog! I need to repeat this mantra with tight-writing and wordcount ESPECIALLY!! I'm getting a bit better at the arriving late part, but writing tight? I wax longer than spaghetti. I remember Deb Raney saying she almost always deletes the last paragraph or two from a scene, which instantly tightens it up. I've employed this method, and I have to say, it really works! Thanks for sharing! This came at a most opportune time for me! Wow, that little phrase IS a gem! It is so simple yet illustrates perfectly the point you were trying to make. thanks. I'm writing that one down! Good afternoon all! I’ve been gone all day, sorry I couldn’t be around to “hang out”. WENDY, I agree. It has made all the difference! JEANNE, one of the keys to “leaving early” is to think “what is the EARLIEST I can cut this scene off?” Then cut sooner—as long as it will make sense for the scene. We don’t need half of what we put into each scene in those early drafts. JOANNE, it tells all in one sentence doesn’t it?? Rachel Hauck is a genius. SUSAN, I thought the same thing when I heard it for the first time from Rachel. It’s so easy to think about and really quite easy to apply and it makes so much difference! SHERRINDA-- Snort. I completely missed that post this week. :- ( Will have to go back! BETH, I completely agree. I have read so many books that just don’t end their chapters/paragraphs/etc with hooks. Your reader has to WANT to keep reading. It’s a bit of soap-box issue for me. ;-) And thank you! ERICA, Thank you! And yes, I’ve heard Deb say that too, another excellent point I have put into practice! LINETTE, I’m glad it came as such a timely moment for you. Like I said, but it bears repeating, learning and then putting this technique into practices makes a world of difference. You will start to see your writing in a new light. Great post. I especially like the idea to cut off the last paragraph. Oooooo so tempting to leave it in. A Pastor friend who did Gospel magic for young people said to me one time at the end of a show and the children called for more, "Leave them wanting." I think this applies to many professions including ours, like Rachel Hauck said. MARY, cutting the last scene has helped me more than once. So often I go back and rehash what already happened and it isn't needed. The reader needs punchy, to the point writing and this helps get there!